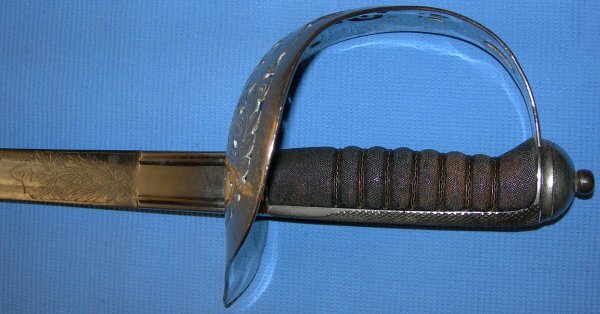 In good condition, an 1897P British infantry officer's sword, George 5th hilt, Edward 7th Claymore blade. In good to very good condition, this George V / WW1 British infantry officer's sword has been mounted with an earlier Edward VII Scottish Claymore blade. So, either the blade belonged to a relative / the father of the officer, and was mounted as a so-called "family blade" into the regulation George V cypher hilt. Or the officer was first commissioned during the reign of Edward VII in a Scottish regiment but was in a British infantry regiment when George V took or was on the throne and necessitated a change of hilt. In either event, an 1897P with a Claymore blade is a very rare item indeed. The 32 inch blade is in exceptionally good condition, etched of course with thistles and the Edward 7th royal cypher, and is firm in the hilt. The nickel plated steel hilt has some small bubbling corrosion as is to be expected. The fishskin grip has signs of wear but is very good, as are the twisted grip wire bindings. The sword sheathes and draws in the leather field service scabbard very well. The scabbard leather is good, the drag very worn, the leather frog and straps a little aged. 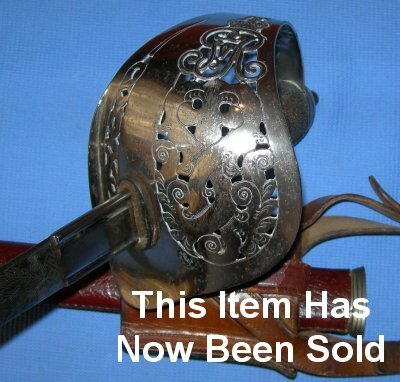 A very nice and unusual sword. Further / large images available upon request. Our item reference number B91 - (599).